Camp Stove From Beer Can. Cookers and Fuel for the Iditarod. As a backpacker (and penny pincher) I was impressed with this clip on how to build an ultra lite camp stove from an aluminum beverage can. I plan on making one of these this year and using it without starting anything on fire. Also attached is a sketch from my Iditarod Sketchbook showing what marathon dog mushers use (cooker and fuel) on the trail to heat water in minus degree weather. I was informed that the fuel pan fits inside the cooker. 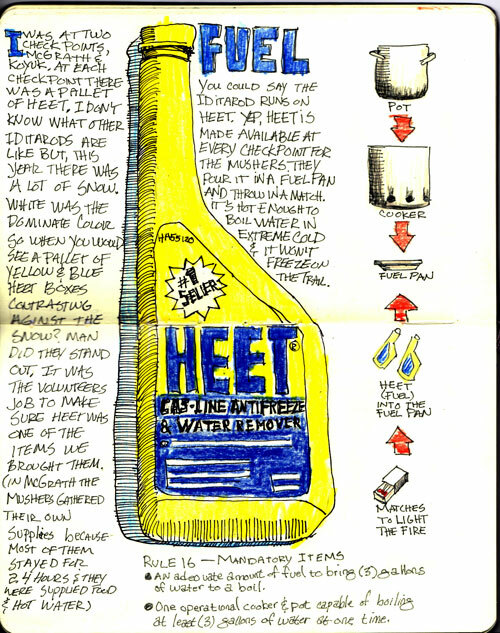 From Iditarod Sketch Book on fuel and cookers used on the trail. Heet and a cooker are considered mandatory equipment and must be in the sled when the musher lands in Nome.